My wooden spider puzzle is from Co/op Manila. The kindest sales clerk assembled it and spray painted it black for me as well. Not only was it on sale, but I got a discount too because of a little damage on one of the legs – the same awesome sales clerk fixed it for me with Mighty Bond. The candle sticks are new, too, from H&M Home, but I plan to use them for other holidays, too, so I can’t say it’s strictly a Halloween addition for this year. Halloween plans fell through because I got caught up in planning Bo’s baptism, adding to our Montessori materials at home, and purging the house. Plus, we rented these awesome costumes for the 2 older boys. Funny, last year, Halloween was the holiday I was obsessed with preparing for. This year, I seem to have caught the Christmas decor fever. Stay tuned! I see people online who have started decorating for Christmas – in Manila, the Christmas season can start as early as September – but 2017 will still be about Halloween for me. 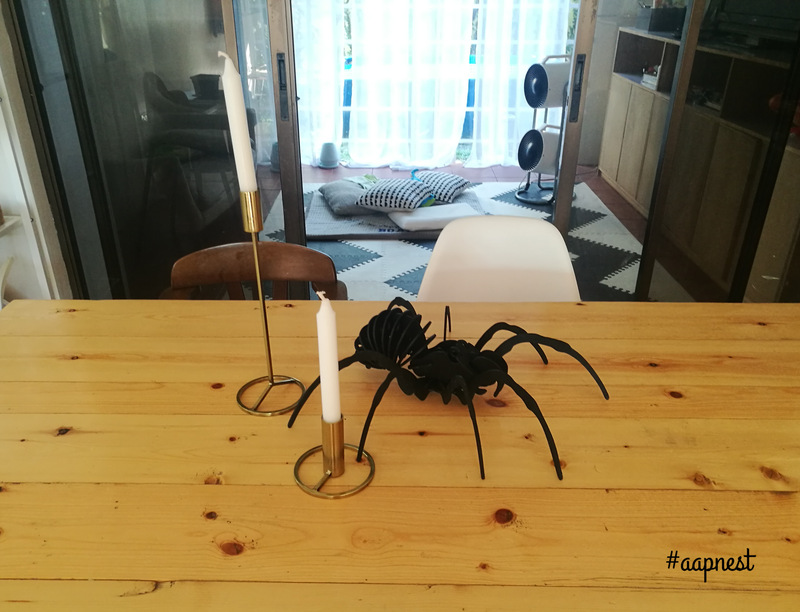 I started last year, and I shared (here and here) how I intend to invest in our Halloween decor bit by bit every year. It’s ironic really, because I love Christmas and have always found Halloween to be such a Western tradition (no Halloween roots in our culture at all! ), but I have little boys who just adore Halloween and all its attendant commercial activities. So, I’ve learned to embrace it in my own little (and pared down) way. That being said, last year I really had my heart set on the wooden spider puzzle they were selling in Co/op, but I felt I had already spent too much in Pottery Barn and La Pomme already. So imagine my joy when I called Co/op the other day and discovered they were still selling those spiders! And! They were marked down – less than half of what they were selling it for last year! I had my spider reserved, and we’ll be picking it up this weekend. I plan to use it as a centerpiece for our dining table. I also ordered this felt Jack O’ Lantern toy and a vampire bin from Fun Nest. Plus Diko and I got those generic buckets from National Bookstore. This means even if I see those lovely zombie books, anatomy and monster prints and skulls they were selling in Co/op last year, I will no longer have the budget to get them! I shall behave. Hopefully, they’ll still be around next year! My terra cotta pots, skull planter from Hey Kessy, and all the other stuff I still like in Quirks (like this monster print and zombie book ends) – and all the other new things I like in Quirks (like this crime scene tape, witch spoon rest, Murder at the Fancy Ball board game, Vladimir bottle opener, and book of masks) will also have to wait until next Halloween too (and possibly the one after that). We are actually decorating this weekend, but I’ll share that in a post once I get my Fun Nest orders!